MORGANTOWN, W.Va. – The Marc Bulger Foundation, established by the former WVU and NFL quarterback for whom it is named, has donated $100,000 to the WVU Medicine Children’s Capital Campaign. 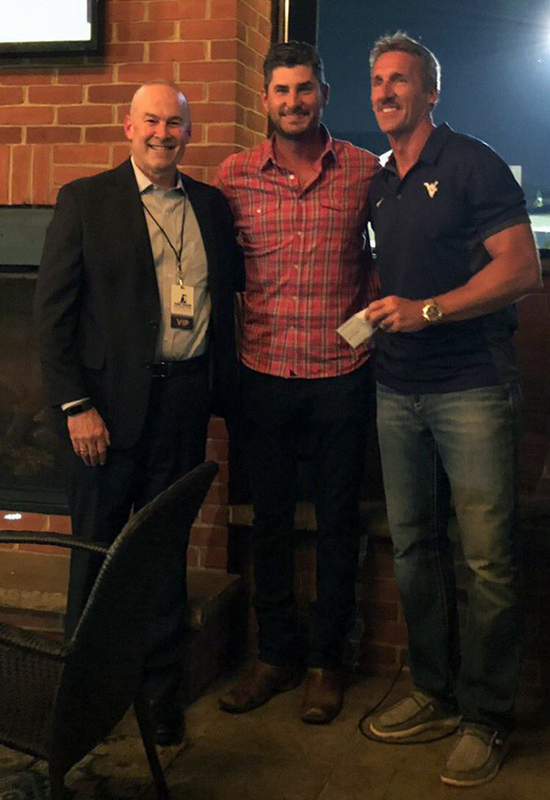 Former WVU and NFL quarterback Marc Bulger (center) presents a $100,000 check for the WVU Medicine Children’s Capital Campaign to Clay B. Marsh, M.D., vice president and executive dean of WVU Health Sciences (left), and Jeff Hostetler, co-chair of the Capital Campaign. A native of Pittsburgh, Bulger was a three-year started for WVU from 1996-1999, appearing in 38 games with 32 starts. When he finished his WVU career, he held 25 school passing and total offense records. He was drafted in 2000 in the sixth round by the New Orleans Saints and signed with the St. Louis Rams in 2001. During his nine seasons with the Rams, he surpassed 20,000 career passing yards in 81 games, becoming the fifth-fastest quarterback in NFL history to reach 20,000 passing yards. He was the second-fastest quarterback in NFL history to reach 15,000 passing yards (56 games). On Sept. 10, 2006, he became the fastest quarterback in NFL history to complete 1,000 passes (45 games). He was a two-time NFL Pro Bowl selection and was named Pro Bowl MVP in 2003. He retired in 2011. The Marc Bulger Foundation’s mission is to find innovative ways to create awareness and provide funding to a diverse range of programs designed to benefit men and women in uniform, as well as children battling life-threatening conditions. The Foundation, launched in 2007, provides support, encouragement, and comfort to service members and children facing adversity by working with related organizations and creating necessary initiatives. Bulger’s gift will be put toward an initiative started by Jeff Hostetler, also a former WVU and NFL quarterback and co-chair of the WVU Medicine Children’s Capital Campaign, to create a WVU sports-themed floor in the new tower for Children’s where patients can get away from their rooms and just be kids. Hostetler and his wife, Vicky, are members of the WVU Medicine Children’s Leadership Council. As a result of their work with the Council, they donated $750,000 to WVU Medicine Children’s in 2017 to establish the Jeff and Vicky Hostetler Family Resource Center. But, Hostetler felt he needed to do more. In the middle of the night, the idea of reaching out to his fellow former WVU athletes came to him. The floor will be designed to look like a WVU locker room, complete with jerseys, helmets, and other sporting equipment. The floor will be decked out in the traditional WVU gold and blue and will have multiple televisions. Photos of former WVU athletes will line the walls, and sports-themed games, like foosball and air hockey, will be available. All of the inpatient rooms will be private, except for 11 NICU rooms for twins. The tower will also include inpatient and outpatient pharmacy facilities and a cafeteria. Former athletes, individuals, and businesses interested in joining Bulger and Hostetler in supporting the expansion of WVU Medicine Children’s should contact Janette Gidley, director of development, at 304-598-4346 or jgidley@wvumedicine.org. Additional information on the Capital Campaign can also be found at wvumedicine.org/growchildrens.